While the Ice Cream Sandwich update news for the Transformer Prime that came out of the NVIDIA presser was big, the other unveiling that took place on stage might mean even more in the grand scheme of things. 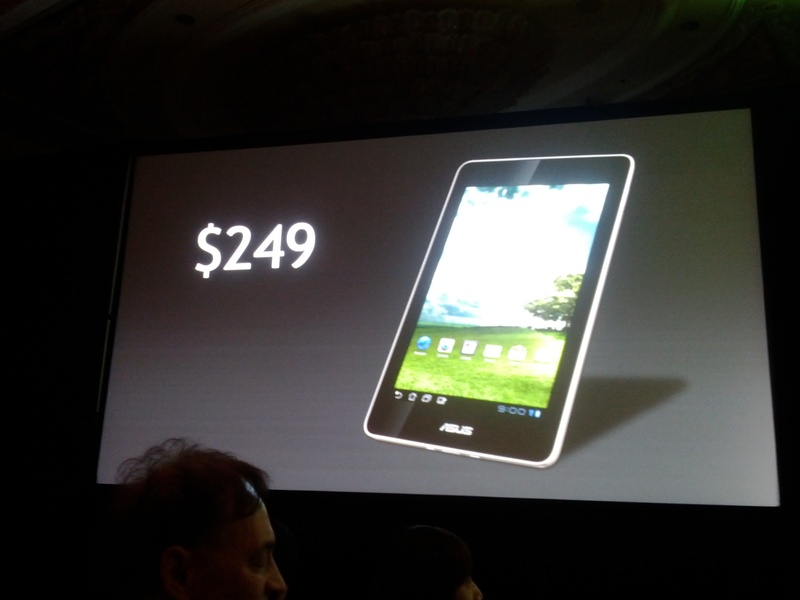 With Asus in the building, NVIDIA CEO Jen-Hsun Huang announced a new Tegra 3 (quad-core) powered mini tablet that runs Android 4.0. It lacked a name and availability, but the price is expected to be $249 at launch. Think about that for a second. The Kindle Fire can be had for $199, but it doesn’t have a quad-core processor, runs skinned Android, and can’t take a picture of anything. This mini tablet (looked to be about a 7″ screen) runs ICS, has cameras, and will crush almost any other device on the planet in performance thanks to its Tegra 3. We are hoping to find out more when we meet 1-on-1 with NVIDIA later this week, but for now, we’ll all just have to sit back and imagine our lives with this personal beast.